It used to be that the American dream was to own a home where you raised a family and later became an empty-nester, welcoming grandkids for holidays and backyard gatherings. Downsizing to a smaller home or condo may have been a rite of passage for some, but certainly most would never have considered renting during retirement. But today, what we think of as a traditional retirement is changing rapidly, and along with it, senior housing design. According to a study by RENTCafe®, people aged 55 and over—or empty-nester baby boomers—are the fastest growing renter population in the United States. This new crop of renters is highly educated and seeking an urban or suburban lifestyle, one we often associate with the millennial generation. While some may laugh at the saying “40 is the new 30,” it’s true that many people no longer feel or act like generations before them. It’s especially true for seniors, who want more out of retirement—and life. Their lives have been shaped by formative decades, from the 1960s to the 1980s, a time of radicalism and creativity. What’s more, while we in the industry classify senior housing construction projects as 55-plus, the fact is that the average move-in age at a senior rental property is 82. People in their mid- to late-50s are still employed, some with children at home. And, 60% of Americans over 60 say they’ll hunt for a new job after retiring from their profession. Moving into what we think of as traditional senior housing is far from their minds. And healthy, active seniors in their 70s and 80s are seeking housing based on wants, not needs. What do they want? Quite often, apartment living fills all of these wants. And while the great majority don’t want to live among young children, many do welcome a senior housing option that includes spaces for singles or couples without children from younger generations. The challenge when designing a senior housing apartment facility is not only to attract residents in a competitive environment but also in its flexibility to serve the aging population as their health declines. If done right, a senior housing construction project will keep residents content and comfortable as long as their health allows. Seeking a senior housing design expert? We at Community Living Solutions have expertise in what seniors are looking for in independent, active living. Ask us about our senior housing design process that includes master planning and construction management. For a no-obligation consultation, complete our contact form or call 920-969-9344. In creating a dementia-friendly environment, the right lighting and space design can have an incredibly positive effect on resident quality of life. In fact, both artificial and natural light, as well as space design, can have an impact on emotional and psychological well-being. At Community Living Solutions, we’re dedicated to designing and building senior living communities that get to the heart of what our clients and their residents need. And when it comes to designing dementia-friendly environments, lighting design plays an integral role in not only creating a peaceful, healing environment but also making life easier for those who care for the residents. Dementia care is complex and can be challenging to manage. So how is it possible that lighting and space—construction aspects that seem deceptively simple—make a difference? The answers may surprise you. Biodynamic lighting allows us to harness daylight’s biological effects even in an environment with artificial lighting, like senior living communities. These biological effects are profound. Reduced exposure to daylight can lead to sleep problems, mood disorders and chronic fatigue. Meanwhile, biodynamic lighting allows us to mimic the variations of natural daylight through intentional design and light management. From a design and construction perspective, opportunities abound. First, it’s important to note how lighting is shown to make a significant difference in the lives of senior living residents, in particular residents with dementia. According to a recent 12-week study of multiple dementia care communities, increasing indoor exposure to daylight was shown to reduce depression among residents. More, it’s been found that exposure to the right amount of daylight is an effective non-drug treatment for those with dementia. Designing a space that allows for increased daylight exposure for residents could then feasibly improve quality of life for the 20 to 30 percent of individuals living with Alzheimer’s disease and related dementias (ADRD). In addition, appropriately tailored lighting has been shown to alleviate sleep disturbances. Among individuals with ADRD, nighttime wandering is a common concern. By reducing sleep disturbances through lighting design for dementia care homes, facilities can also reduce this phenomenon. Less wandering results in a reduced risk of dangerous falls. Also, a tailored lighting design or intervention that stimulates the resident’s natural sleep and wakefulness cycles are shown to decrease what’s known as “sundowning,” or late-day confusion among dementia patients, while improving behavioral problems and lessening agitation. One recent study on lighting and Alzheimer’s patients showed at the end of just four weeks of lighting intervention, sleep disturbance and depression dropped significantly, and by the end of six months, sleep disturbance and depression scores dropped by half. Other studies have mirrored these findings while also noting decreased agitation scores. How well we can see is central to a number of our needs, from our sense of safety and wellbeing to our health, mood, task performance, social communication and aesthetic judgment. As a result, how we see and perceive our environment impacts our emotions, motivations, behavior and even our long-term memory. Through biodynamic lighting in design for dementia care homes, we are able to send the appropriate cues to our bodies by mimicking the appropriate outdoor lighting for everything from dawn to daylight to dusk, including the nuances of an overcast sky, mid-afternoon sun rays and even sunset. Lighting “dose” can be adjusted for intensity, duration, timing and more, and it can be customized for individual environments, including resident rooms, community rooms and general areas. 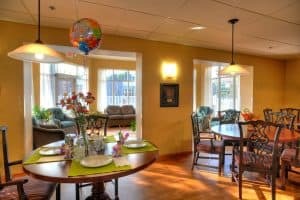 Now that we recognize the potential for lighting in senior living environments and how it factors in dementia care, here are some recommendations for designing and building a dementia-friendly environment. Minimize exposure to blue-rich light sources after 8 p.m. In addition to lighting interventions, use of space and purposeful wandering capability for residents improves quality of life for individuals with dementia. From an architectural perspective, it’s important to design a home-like environment for residents, one which engages the senses, reduces confusion and feels familiar. Common areas that feel homey, including living room-like spaces and comfortable dining areas, go a long way in comparison to the hospital-like environments in the past. At Community Living Solutions, we’re eager to help you design the future of your dementia care home. From lighting to space design and more, our experts are ready to help you create a senior living community that provides the highest possible quality of life for residents while achieving your business goals. If you are interested in seeing how we can help you develop senior care solutions and design for dementia care homes, request a consultation through our Contact page or call us at (920) 969-9344.